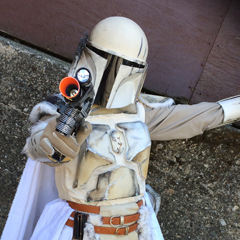 Keldabe Talk Radio (KTR) is the official podcast for the Mandalorian Mercs costume club. In production since winter 2007, our very own online radio show airs (usually) once a month through download on this page. You can also find us on iTunes by clicking the correct link above. If you have any questions or comments, please email us. Please also join in the discussion on our very own forum board, linked below. You may also subscribe to our RSS to download all of our shows and listen on the go! Have a question? Use the link above to go to our forum and ask. We’ll answer. 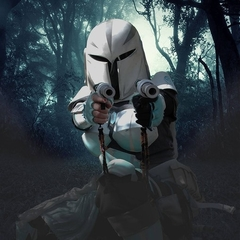 Arch (A. Anderson) became an official member of the Mercs on the same day as Chro in 2010, and she’s been helping hold down the fort up in Wampa territory ever since. When she’s not wearing the armor, she’s a graphic designer. When she is wearing the armor, she’s still a graphic designer but it’s a little harder to see what she’s working on. Arch is located in Maine. 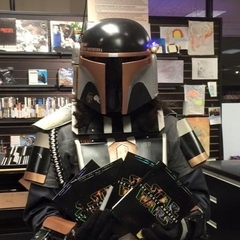 This month we catch up on some Mercs News, and talk Star Wars gaming at Celebration. This month we congratulate our new Order of the Ori'Ramikad members and talk to Brigadier Vraeden. Our final episode of 2018! We talk about how MercsCon went, the Mandalorian, and how Anakin would've turned out if Qui-Gon hadn't been stabbed. Episode 100 - KTR Live at MercsCon! Our Centennial episode, and recorded before a live audience at MercsCon no less! Our special live beach episode! We talk about our final pre-MercsCon dreams, our pre-The Mandalorian dreams, and flying with a lobster in your luggage. We talk about how much we still love Solo, how much we love Kelly Marie Tran, and how much we love Lego. We talk with Vastoom, about Star Wars, and about Mercs News! We talk about our feelings on Solo, bullying, and bid a fond farewell to Dar Kyram as he retires from the Podcast Team. We talk about the new Solo film, the TLJ blu-ray release, and changes in the Mercs! We talk with Quartermaster Coreysnapps about MercsCon! We also talk about the new Solo trailer, Mercs Madness, and the future of Star Wars video games. 2018's first KTR, we return with our thoughts on The Last Jedi, Mercs News, and our continuing hope for a new Obi-Wan movie. Part 1 of our December 2017 Episode! We talk changes in the Brigades, our final pre 'The Last Jedi' thoughts, new merch, new websites, and Battlefront 2! We chat about the latest Episode VIII trailer, new merch, and the new title of Solo. We talk director changes, MercsCon wrestling, and disaster relief. We talk Porgs, sparklefoxes, new X-wing ships, Ron Howard, and Misha's love of Han Solo. We discuss the director change for the new Han Solo film, our guest Mirdala, and buying stuff on the forums. "Keldabe Talk Radio, June 2017" from Keldabe Talk Radio. Released: 2017. Super Special Episode: Celebration Orlando 2017! Join us as most of the crew talks shop at Celebration Orlando 2017! We interview Kathlyn Chassey, known as the "Littlest Wookiee", and get to hear her life story! We promise there is absolutely nothing wrong with this episode. Seriously. We interview Honorary Member Robert Cunningham, talk about Celebration, Disney World, and the Han Solo Movie! Join us as we talk about Celebration Orlando, Or'Ramikad Inductees,and Star Wars Rebels! Our final episode of 2017. 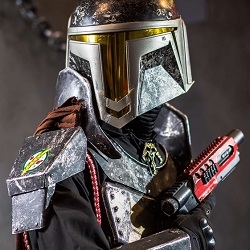 We talk with Vraeden, Brigadier of the Mandalorian Mercs Brigades, our personal hopes for RogueOne, and answer your questions with answers. "November 2016" from Keldabe Talk Radio by Mandalorian Mercs. Released: 2016. We talk with Public Relations Officer Saz about MercsCon! We talk with Personnel Officer Ulrik Kanteer about the upcoming App Team hiatus, a new format for X-wing, and how cool Donnie Yen is. We welcome Dar Kyram on as a cast member and talk the latest Mercs and Star Wars news including Grand Admiral Thrawn! 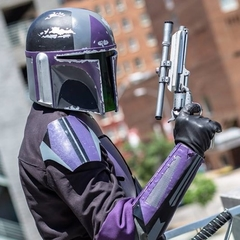 A quick Mercs news update and some info on the Mercs at Star Wars Celebration London. We talk Celebration tips and Mercs News. Our real April 2016 Episode featuring Quartermaster Coreysnapps! Episode 71 - Mandalorian Pilots, how to run a table, and why you shouldn't be afraid of the forums. Our 2015 Almost the Best of Keldabe Talk Radio clipshow! Our December 2015 episode with Lem'zig Dee! November 2015 episode. We talk the Episode VII Trailer, Rebels Season 2, and new Mercs News! We interview Club Alor, Ohl'd Vart and discuss the latest Star Wars news. Special Guest: Sidi Ren! We talk about Star Wars on Netflix, EVA foam, and the KTR patch. Interview with voice of Kanan, Freddie Prinze Jr! "April 1st" Podcast. Released: 2013. Genre: Podcast. "July 2011" by Keldabe Talk Radio. Released: 2011. Genre: podcast. "June 2011" by Keldabe Talk Radio. Released: 2011. Genre: podcast. "May 2011" by Keldabe Talk Radio. Released: 2011. Genre: podcast. 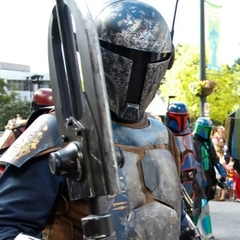 "Episode 23" from 2011 by Keldabe Talk Radio: the Mandalorian Mercs Official Podcast. Released: 2011.